STUNNINGLY GORGEOUS Luxury Home in Palm Springs! The DREAM HOME! This STUNNING Beautifully Decorated Home is an AMAZING VACATION EXPERIENCE! If you want ELEGANCE, the Dream Home is for YOU! YOU will create MEMORIES that will last a LIFETIME and experience the history of Palm Springs, all in this 800 sq. ft STUNNING home with clerestory windows, exposed-beam ceilings, the latest home TECHNOLOGY, a large kitchenette, granite counters, full walk-in shower, and a PRIVATE POOL & SPA! This home is UNBELIEVABLY GORGEOUS, with a privacy fence, gated parking, a barbecue area, BREATHTAKING MOUNTAIN VIEWS! You simply DESERVE IT! You will be AMAZED at this home so close to downtown! 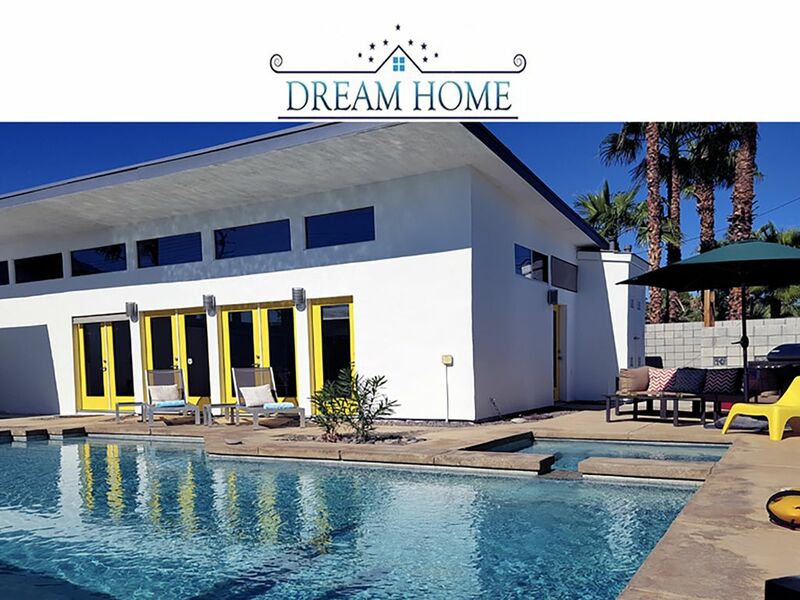 You will never want to leave this stunning piece of Palm Springs! You will also have your very own remote control gate to park your car next to your home behind a self-closing gate. You are welcome to invite friends over for a small party or cookout on your grill. All the kitchen utensils are provided. You just bring the food and start grilling! The home is FULL of TECHNOLOGY from Alexa, to a Nest thermostat and even control the temperature of the spa directly from a wireless tablet in the home! The home has amazing ambiance overlooking a heated pool and spa. The home has a queen bed with a memory foam mattress and bamboo pillows. It also has a couch in the same room that could be used for a child or an adult. The home is full of beautiful MODERN furniture to give you the true Palm Springs Experience. The Dream Home is completely surrounded by a privacy fence which gives you complete privacy during stay! **Pool heating is available for an additional optional charge during the months of November - December - January - February - March (see ADDITIONAL RULES for details). * Pool Heat Charges tracked by Pentair Software program during your stay. * Pool heat invoice charges will be emailed the week before check-in. * Payment must be made before check-in. The homeowner manages the property and special attention to every detail of the home and provides an exceptional customer service experience! For guests staying a min of 7 days. This was a great little spot for a couple’s get away. It was very clean and centrally located with good amenities. Because it is so centrally located there is a little noise from the cars on the street. The pool gets good sun and was very clean. The bed was very comfortable Steve was extra friendly and made for a great stay. We would definitely stay here again! Thanks again! 5 Stars!!! Seth and his beautiful wife were AMAZING guests! They were in Palm Springs to celebrate their honeymoon! From the time Seth booked until the day he left, his communication skills were EXCELLENT! They left the home in IMMACULATE condition and treated it like it was theirs. They both had great personalities and were a joy to have in the Design House! Thanks, guys for an AMAZING HomeAway EXPERIENCE! You are always welcome in the Design House or any other property we may have. I really hope to see you both again. I would highly, highly recommend them to any HomeAway host ANYWHERE in the world! We had a wonderful visit. Steve is a very attentive and kind owner. The house is wonderfully prepared with everything you could need for a weekend getaway. We will be back! Mike and his family and two dogs were AMAZING guests! They were all so friendly and took great care of the Dream Home! They are most certainly welcome back anytime. I would highly recommend them to any host ANYWHERE in the WORLD! Everything about this experience was perfect for my writer’s retreat needs. Quiet, private, even more beautiful in person and right near town for a stroll, to grab a meal or hit the grocery or dog park. Cannot recommend Steve or this property any higher. Come unwind at this totally solar powered dream house complete with state of the art technology and equipment. Thanks again Steve! I selected this property not knowing anything about it's location, and proximity to downtown and homes of the stars. What drew me to the property was the private pool, spa, bicycles and mid-century decor. We were not disappointed. The home was very clean, modernized and comfortable. My husband, who is a natural born critic, could not find anything negative to say about the property, it's location and amenities. He loved spending time in the pool and spa or just lounging outside and enjoying the sunsets. He is definitely ready to return there TODAY. In a most recent review, the guest commented about the street noise and the flight noise from the nearby airport. Having lived on our boat at Cabrillo Isle Marina, across from San Diego International Airport, we were not bothered by these noises. We both slept very well on the very comfortable TemPurpedic mattress and hardly noticed any plane or street noise doing our stay. We really love this property and highly recommend it to those wanting privacy, comfort and style. I like to think of it as "luxury in a jeweled box". We will definitely rent it again because it provided all that we expected and more. We enjoyed biking to town for shopping, dining and entertainment. Biking/walking all around the different named neighborhoods and enjoying seeing the various architectural style homes. Yes, we did use our car to go grocery shopping, but all other travels were by biking or walking. Our gracious host and homeowner Steven was attentive and accommodating. He was always quick to respond throughout the booking and rental processes. Upon arrival, we appreciated hearing about the history of the house, how to operate appliances and use the different systems, and learn about the festivities happening in town. Thank you Steven. Our stay was fabulous and we are already planning our return stay! Beautiful home with a large heated pool and spa! Steve is a gracious host who was very responsive to any needs or questions we had. He has prepared this property beautifully to accomodate most visitors. It’s a warm and inviting space that we found most welcoming. With lots of natural light and beautiful mid century styling, this property is truly Palm Springs. The bed is possibly the most comfortable that we’ve slept in while staying in a rental. A Keurig coffeemaker is provided. This home has WiFi and internet tv only. Our favorite time was relaxing in the pool and spa or sitting pool side. The only negative was some traffic and airport noise as the home is located on a busy intersection near the airport. Without a doubt we recommend this property and look forward to our next visit.